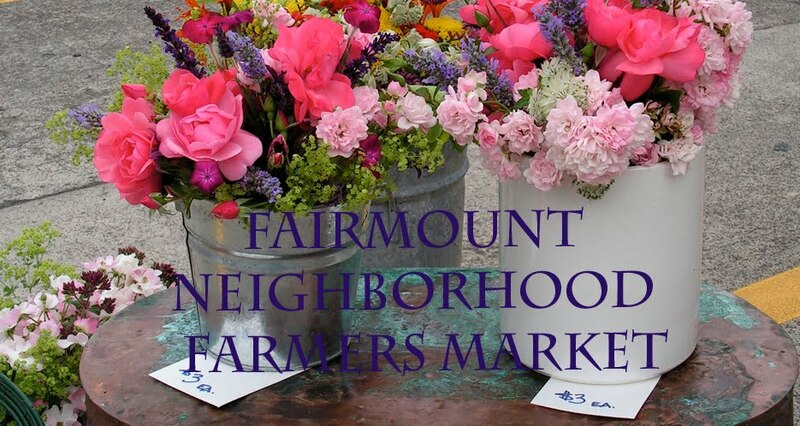 This Sunday at the Fairmount Neighborhood Farmers Market you will find fresh eggs and pastured chicken, beef, pork, and lamb from Fair Valley Farm and Fog Hollow Farm, as well as fresh cut flower bouquets from Tiger Lily Art Company. Camas Swale Farm will have lots of fresh produce: melons and watermelons, strawberries, garlic, salad greens, pardon peppers, carrots, and tomatoes, including heirloom, cherry, and paste (time to start stockpiling sauce for the winter). 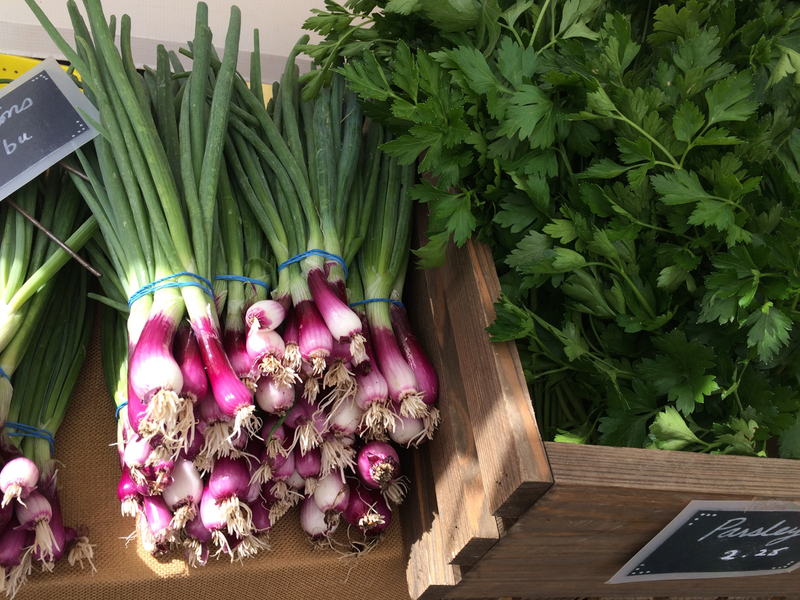 There are certain items one should pick up at the market regardless of your shopping list or menu plans. 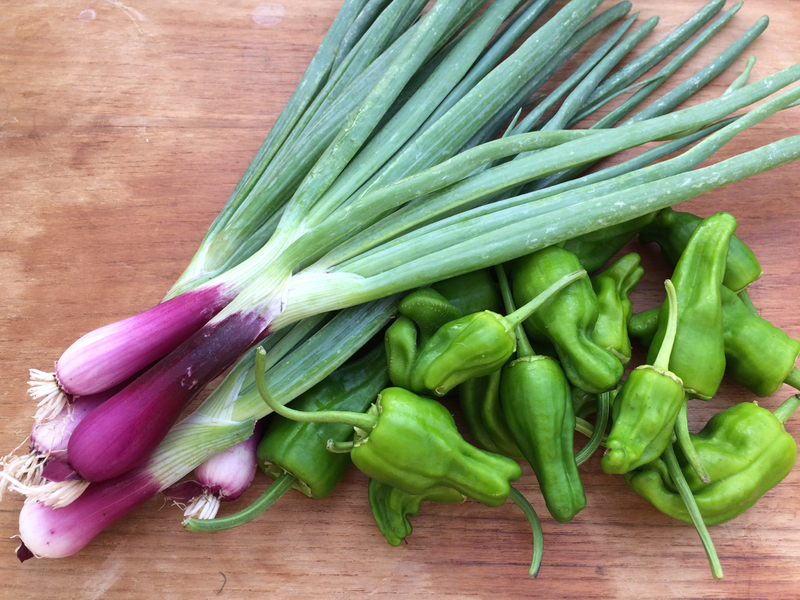 Our policy is to purchase padron peppers whenever available because they are always a special treat. Similar logic applies to Camas Swale's perfect melons, which don't require a recipe, beyond "eat." Less intuitive might be a bunch of scallions, although pretty purple ones like these are hard to resist. 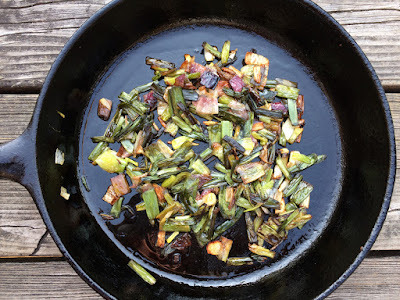 Lately I've been making a habit of buying a big bunch of scallions and immediately cooking them down in oil into a couple of tablespoons of crisp, sweet, intense flavor. We first tasted these in Shanghai and then recaptured them with the help of Fuchsia Dunlop. It doesn't matter if you have a plan for these at the time, you will simply thank yourself later for having made them. This week we gobbled them up right away as a topping for some soba noodles along with some seared padron peppers, which are essentially the same as shishito peppers so I'm calling them by their Asian name for this dish. Trim the roots off the scallions. Wack the whites with the side of a large chef's knife to split. Cut into 1 inch lengths. Heat the oil in a skillet or wok over medium high heat. Add the scallions and cook, stirring frequently. Keep cooking the scallions until they are quite browned, but avoid burning them. This will take patience and some nerve, but you will be rewarded with intense flavor. Transfer the scallions and oil to a small bowl. In the same skillet or wok you used for the scallions, heat the oil over medium high heat. Add the peppers and allow to sear until well browned and blistered on one side. Use tongs to flip and brown the second side. Remove to a bowl and sprinkle with a pinch of sea salt. Cook the noodles in salted boiling water until barely cooked through (about 5 minutes). In the meantime, mix the soy sauce and sesame oil in a serving bowl. When the noodles are done, immediately rinse them under cold water and then toss them in the serving bowl. 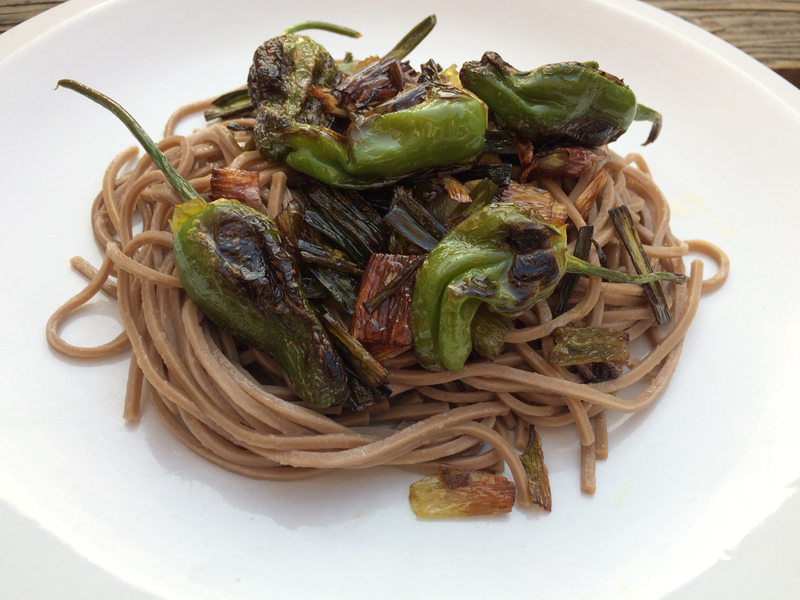 Serve the noodles and top with the seared scallions and scallion oil and the seared peppers. Enjoy.